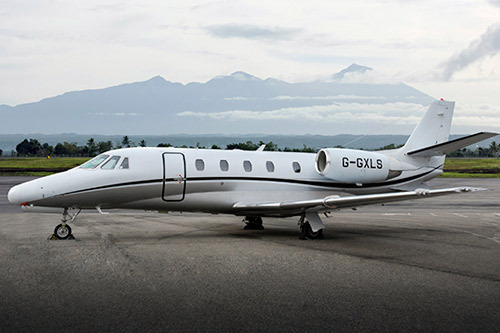 Standard Citation XLS (9 + 2), Center Club with Forward Two-place Divan, Two Aft Forward-facing Seats and Belted Seat located across from Lavatory. Passenger Seats are Townsend Matt Black Leather, Window Reveals in Vanilla-Colored Fabric, Lower Sidewalls in Black Suede. The Carpet in Flannel Cut Pile, and Cabinetry in High Gloss Dark Veneer with Satin Nickel Hardware. Two-tone Paint Scheme, in Whisper Gray and Starlight Silver Metallic and Black Metallic Accent Striping.